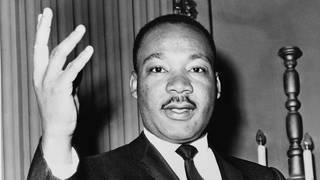 Remembering Historian Vincent Harding, Who Drafted Dr. Martin Luther King’s Anti-Vietnam War Speech | Democracy Now! historian, author and civil rights activist. AMY GOODMAN: We end today’s show remembering Vincent Harding, the historian, author and civil rights activist. He died Monday at the age of 82. He was a friend and speechwriter for Dr. Martin Luther King, and he wrote the draft for Dr. King’s famous antiwar address, “Beyond Vietnam.” Speaking on Democracy Now! in 2008, Vincent Harding talked about the speech. DR. VINCENT HARDING: There was a great deal of struggle within the community around Martin about the speech—even more than about the speech, about what position King should take in relationship to what our country was doing in Vietnam and what our country seemed intending to do all over the world. But it’s important to recognize that King saw these issues not simply as what we call foreign policy issues. King was most deeply a pastor, and King saw these issues in terms of what they were doing to the poorest, weakest, most vulnerable people in this country, as well as what they were doing to the poor of other countries, particularly, in this case, Vietnam. So King did not see himself as separating his attention from this country and turning it overseas. King saw the natural connection between what was happening to the poor in the U.S.A., why young men and women were rising up in anger, frustration, desperation, saw that action as deeply related to the attention that the country was paying to the devastation it was doing in Vietnam. And so, King was actually trying to bring the country together to sense the relationship between its sickness at home to the sickness of its policy overseas. AMY GOODMAN: Vincent Harding, the historian, author, professor and civil rights activist, died Monday at the age of 82 in Colorado. He was a friend and a speechwriter for Dr. Martin Luther King, and he wrote the draft for Dr. King’s famous antiwar address that he gave at Riverside Church April 4th, 1967. Vince Harding was also professor emeritus of religion and social transformation at the Iliff School of Theology in Denver. We will link to all our broadcasts of interviews with Dr. Vince Harding.